These Forward Motion shorts I won at an eBay auction in 2003. Seller was sportingguy27, and it was given this pic to this description at the auction: You are bidding on a Great pair of Lycra Shorts by Forward Motion. They are Black with an aqua-Blue stripe down the legs. 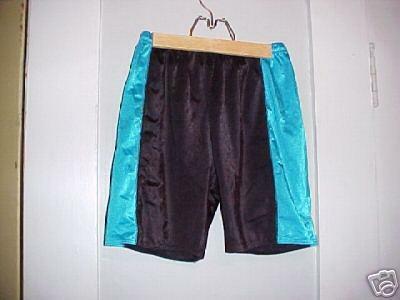 These Lycra Shorts are made of a Nylon Lycra Spandex mix, a very stretchy and shiny material. They are a size Adult Large and are in Excellent condition.